The Chief Economist at Bank of America Merrill Lynch (Australia) said he believed the Reserve Bank would leave interest rates on hold Feb 4th, and warns potential home buyers are being locked out of the housing market by investors. What has caused such a huge shortfall in dwellings? Public agencies have built an average of less than 6000 new dwellings a year since early 1990s compared with about 12,379 dwellings a year between the mid-1970s to the early 1990s. The average number of people per dwelling actually rose (from 2.61 to 2.64) between the 2006 and 2011 censuses... For the first time in at least 100 years. The Result - Long term pent up demand, with a substantial shortfall in dwellings for a rising population. 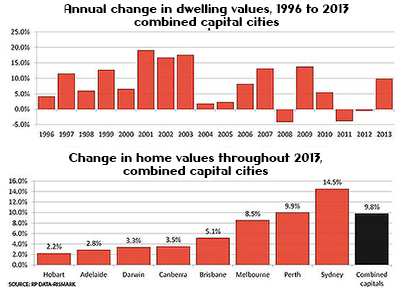 The Economic Cycle - Property Value and Prices going up. The Opportunity - High level need and demand for affordable rent. NRAS provides investors the instrument and opportunity to realise sustainable strong returns, whilst funding the delivery of dwellings into the market, with significant, positive social impact . Hear what Carol Croce (executive director community housing federation of Australia) and Caryn Kakas (executive director of residential development council of Australia) have to say about NRAS. Brisbane potential double digit growth. The Brisbane property market has been the worst performer of the capital cities in the nation with the median house price taking a tumble of 7 per cent. Examples of the rental property shortage was highlighted (18th October 2011)on the ABC (Australian Broadcasting Corporation) reporting fifty-three new rental properties are to be built in Moranbah under the National Rental Affordability Scheme - but with families paying upwards of $1500 a week for a three bedroom home, there is probably pent up demand for more to be released. Saul Eslake, economist of the Grattan Institute identifies the cause of the challenge for rental affordability by highlighting a staggering "Ninety-two per cent of investors in rental property buy established property, so it does nothing to increase the supply of housing or keep rents down..."
The NRAS program is designed as a social impact investment opportunity providing a method and incentive for Australian investors to not only buy new property and build their wealth with tangible real property assetsbut to stimulate the economy and building industry nationally whilst significantly improving the rental affordability in high growth areas. The NRAS scheme is not housing commission or social housing. NRAS properties are rented to private individuals and families with incomes of up to $104,913 pa. Approximately 1.5 million Australians are eligible to be NRAS tenants. There are also specified guidelines for the management of NRAS properties. The manager is reponsible for ensuring that tenants meet the income criteria and that they are reviewed against the criteria every two years. The NRAS program (National Rental Affordability Scheme) is designed to stimulate the building of new rental homes in growth areas to satisfy a high demand for reasonably priced rental property. - Increase the supply of new affordable rental housing. - Reduce rental costs for low and moderate, income households. - Encourage large-scale investment and innovative management of affordable housing. - encourage investors to develop additional new houses for the rental market. - provide an affordable rent program for average Australian wage earners as individuals, couples and families. The NRAS tenants are intended to include key and essential service workers, for example, childcare workers, nurses, police officers and fire-fighters. - yield higher than usual returns for investors in the residential property market. - increase the number of rental dwellings built through the stimulation of demand and investment, while supporting the building industry and related jobs and the Australian economy. NRAS Australia news provides latest developments for social impact investment opportunities with nras real estate, running across New South Wales (NSW), Queensland (QLD), Western Australia (WA) and South Australia (SA). You can find specifics about individual nras development projects such as nras new south wales,nras qld,nras queensland,nras wa,nras western australia,nras sa,nras south australia, in the property listings links in the NRAS Australia site.